Department of Physics 1, JBAS College for Women, Chennai - 600018, Tamil Nadu, India. S. S. Diagnostic Centre 2, Royapettah, Chennai - 600014, Tamil Nadu, India. Department of Chemical and Process Engineering Technology 3, Jubail Industrial College (JIC), P. O. Box 10099, Jubail Industrial City 31961, Kingdom of Saudi Arabia. Department of Physics 4, Pachaiyappa’s College, Chennai - 600030, Tamil Nadu, India. Department of Biochemistry 5, Saveetha Dental College & Hospitals, Saveetha Institute of Medical & Technical Sciences (SIMATS), Saveetha University, Chennai - 600077, Tamil Nadu, India. Department of Biochemistry 6, Chettinad Hospital & Research Institute, Chettinad Academy of Research and Education (CARE), Rajiv Gandhi Salai (OMR), Kelambakkam, Chennai - 603103, Tamil Nadu, India. ABSTRACT: Objective: To compare the routine biochemical and histological techniques with FTIR-ATR spectroscopic methods in diagnosing hyperlipidemia. Materials: Compositional changes in the serum and tissues reflects the healthy and pathological status of animals. FTIR-ATR was attempted as an additional tool for evaluating the composition in the serum as well as in tissues materials. To achieve this Wistar rats are administered with high cholesterol suspension with coconut oil orally for 30 days. Results: Hyperlipidemia achieved with oral feeding of cholesterol-rich diet (200 mg/dl) on rats with body weight of 180 ± 10.0 g led to a rapid progression of hyperlipidemia resulting might cause atherosclerosis. In blood, cholesterol level (269 ± 8.72), Triglyceride (194 ± 5.03), LDL (165 ± 5.10) increased and a decrease in the serum HDL level (39 ± 3.09) obtained in the cholesterol-rich fed hyperlipidemia was observed. 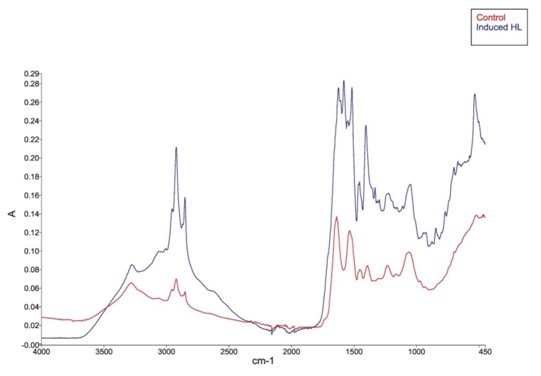 FTIR- ATR spectral peaks were obtained (1165 cm-1 for ring vibration mode of C-O-H and C-O-C bonds cholesterol ester with phosphoric acid, 1742 cm-1 responsible for C=O group of cholesterol ester (HDL) and 2961 cm-1 for triglycerides, etc.,) and internal peak ratio were calculated for different biomolecules analysis. The histopathological studies indicated that the high cholesterol diet fed to Wistar rat liver showed the appearance of microvesicular steatosis. Hepatocytes showed hydropic degeneration, swollen, vacuolated cells and fatty liver. 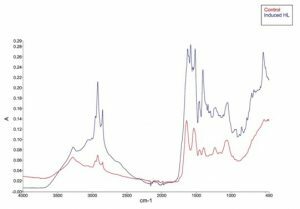 Conclusion: The results of FTIR-ATR spectral analysis supports the biochemical and histopathological changes obtained in control and experimentally induced hyperlipidemic Wistar rat and could be considered as the additional technique diagnostic sector. INTRODUCTION: Hypercholesterolemia is the presence of a high level of cholesterol in the blood. It is not a disease, but a metabolic derangement that can be secondary to many diseases and can contribute too many forms of the disease, most notably cardiovascular disease. It is a leading cause of morbidity and mortality from infancy to old age. Cardiovascular diseases have remained one of the leading causes of death all over the world. The development of these diseases has been linked to several factors such as high-calorie diet intake, lack of exercise, smoking, age, alcohol consumption and genetic disposition 1. These factors ultimately result in disorders of lipid and lipoprotein metabolism including lipoprotein over production and deficiency 2. Clinical Diagnosis is the process that identifies a possible disease or disorder that can be diagnosed through analyzing certain components with multiple techniques and procedures that identifies the internal physiological changes occurring due to the disease which is followed by treatment and prognosis. Cholesterol reduces the permeability of the plasma membrane to neutral solutes, hydrogen, sodium ions, etc. Within the cell membrane, cholesterol also functions in intracellular transport, cell signaling and nerve conductions. The rise of cholesterol in the body give a condition in which excess cholesterol is deposited in artery walls called atherosclerosis and the condition that block blow to the vital organs which result in blood pressure or stroke. Based on the content of protein and fat portions differentiated as HDL also called good cholesterol since it removes cholesterol from the cell. LDL otherwise called bad LDL cholesterol that cause plaque build on the walls of arteries leads to the risk of heart diseases. Till the date numerous physiological biomarkers been identified that are associated with increased cardiovascular risks. These markers display cellular lipid interactions and physiological functions of serum lipid bearing proteins and assist in clinical decision making and authenticated risk. Many of these biomarkers, alone or in combination, can be incorporated into risk prediction models to determine whether the irradiation increases the model’s predictive ability. Diagnostic procedure may involve components of multiple techniques and procedures encompass all investigations and tests intended to identify the cause of an illness or disorder. The conventional methods have made exponential progress for the last many years but suffer from few limitations occurring as a result of low specificity and lack of efficacy. FTIR-ATR is a non-invasive, reagent-free diagnostic tool which can be rapidly and simultaneously analyze several components in the biological fluids and organs and which can be employed in analyzing the biomolecules. Therefore FTIR-ATR spectroscopic techniques were employed to evaluate biomarkers by studying the variations on biomolecule composition in blood serum and organs of control and experimental animals concerned. The FTIR-ATR spectroscopy is based on the phenomenon known as Total Internal Reflection (TIR) 3, 4. This internal reflectance creates an evanescent wave that extends beyond the surface of the crystal into the serum sample and lyophilized tissue held in contact with the crystal. It can be easier to think of this evanescent wave as a bubble of infrared that sits on the surface of the crystal. This evanescent wave protrudes only a few microns (0.5µ-5µ) beyond the crystal surface and into the sample. The depth of penetration of infrared radiation from denser IRE into the test material depends on refractive indices of the materials to be investigated and the wave number of the infrared radiation. As the sample absorbs IR radiation at certain frequencies, the resultant reflected radiation (or), evanescent wave will be attenuated (altered) in regions of the infrared spectrum where the sample absorbs energy 3, 4. This attenuated IR radiation of evanescent wave is passed back to the IR beam, which then exits the opposite end of the crystal and the detector detects it in IR spectrometer. The system generates an infrared spectrum, and these spectra were helped in analyzing various components. Procuring of Animals: Experiments on the animal model was conducted to rule out various biomarkers in hyperlipidemia using FTIR-ATR spectroscopy and compare with routine biochemical as well as histopathological techniques. To satisfy this, Wistar rat were received and maintained as per standard protocol with ethical committee approval. This study was approved by the animal house of Research and Development, Saveetha Medical College and Hospital, Thandalam, Chennai, India. All experiments were carried out according to the guidelines for care and use of experimental animals and are approved by Committee for Control and Supervision of Experiments on Animals (CPCSEA) and the Institutional Animal Ethical Committee. Six (both sexes weighing between 120 and 150 g) Wistar rats per cage were housed in polypropylene cages (32.5 × 21 × 14) cm lined with raw husk which was renewed every 48 h. The animal house was maintained at an average temperature (24.0 ºC ± 2 ºC) and 30-70% RH, with 12 h light-dark cycle (lights on from 8.00 a.m. to 8.00 p.m.). Animals received human care and were fed with commercial pellet diet, and the animals were acclimatized for one week before the start of the experiment. Experimental Design of Induction Study: Wistar rats were randomly divided into 2 groups of 6 rats each. Group 1 served as the normal control and received distilled water and animals in group 2 (hyperlipidemic rat). To establish the Hyper-lipidemic clinical status in Wistar rat, Cholesterol, Sigma Aldrich (25 gm Grade, ≥99%) and cholic acid (besofic), Kausikh Therapeutics (P) Ltd., India was purchased and stored. To obtain hyperlipidemia condition, Wistar rats were fed with high cholesterol diet (1% cholesterol and 0.5% cholic acid saturated with 2% coconut oil) in addition to administration of standard diet administered daily for 45 days following the standard procedure 5. Collection and Processing of Blood serum and Organs: At the end of experimental induction study, the Wistar rats fasted overnight. Blood samples of the Wistar rats were withdrawn from the heart. Under mild anesthesia before killing and collected in plain and EDTA tubes for further analysis. Plasma and serum were separated by centrifugation at 3000 rpm for 15 min. Further, fresh serum samples were properly preserved in ice bags and immediately transported to the wet lab for FTIR-ATR spectral analysis. The experimental rats were killed for excision of organs like Heart, Liver, Lungs, Kidney Muscle, etc., and washed with saline and refrigerated for lyophilization. Lyophilization of organs tissue was done by Scanvac, cool, safe, 55-9 Denmark vacuum concentrator at Central Institute of Brackish-water Aquaculture, Indian Council of Agricultural Research, Govt. of India, Chennai. Further, the freeze-dried samples grounded to a powder using mortar and pestle preserved in desiccators containing silica gel till FTIR-ATR spectral analysis. For histological study, the different organs were dissected out, washed with saline and fixed in 10% formalin for further processing. Biochemical Analysis: The quantitative analysis of blood, as well as tissues of different organs, is a major field in the clinical chemistry, and its composition is the preferred indicator concerning the pathophysiological condition of the system. The blood serum was analyzed for biochemical parameters including glucose, urea, creatinine, Ca, phosphorus, uric acid, SGOT, SGPT, total protein, albumin, cholesterol, triglyceride, HDL etc., concentration by enzymatic assay method using respective commercial diagnostic kits and serum total T4, T3, and TSH concentration was determined by ELISA method (detection kits provided by Transasia, Zemun, SCG) in a reputed clinical laboratory in Chennai. FTIR-ATR Spectral Measurements: FTIR-ATR spectral analysis of blood serum and lyophilized of different organs (heart, liver, lung, muscle, and kidney) of healthy control and hyperlipidemia induced Wistar rat were carried out at Sophisticated Analytical Instrumentation Facility (SAIF-SPU), St. Peter’s University, Avadi, and Chennai-600 054, using PerkinElmer Spectrum-Two FTIR Spectrophotometer with Attenuated Total Reflectance accessory having highly reliable and single bounce diamond as its Internal Reflectance Element (IRE). Experimental serum Samples were analyzed for spectral recordings in the Mid IR region of 4000-450 cm-1. As water is a good absorbent of infrared radiation, it affected the actual spectral response of the test material and dominated in the FTIR spectrum of the serum sample. A serum sample was placed on the IRE crystal, and the water content on the serum sample is removed by an air drier. FTIR spectral measurements were carried at room temperature, and each measurement was repeated to ensure the reproducibility of the spectra. These spectra were subtracted against the background of air spectrum. After every scan, the crystal is cleaned with isopropyl alcohol or methanol soaked tissue and background of new reference air were taken to ensure the crystal cleanliness. Histological Studies: The 10% formalin fixed different tissue samples of organs including Lung, Heart, Liver, Kidney and Muscle were dehydrated in ascending grades of ethyl alcohol, cleared in xylene 6 and embedded in paraffin wax. Sections of 5 µm thickness were cut by rotator microtome 7. At least 25 tissue sections for each organ were assessed. The sections were processed and passed through graded alcohol series, stained with hematoxylin and eosin 8, cleaned in xylene and coverslipped in DPX. Histological examination was done under 10X magnification using Trinocular Research Zeiss Microscope (Gottingen, Germany) and further obtained from 10 random microscopic fields per animal at X45 and X100 objective. Statistical Analysis: All statistical analysis was performed using Statistical Package for Social Science (SPSS, version 17) for Microsoft Windows. The data were not normally distributed. And therefore Non-parametric tests were performed. Descriptive statistics were presented as numbers and percentages. The data were expressed as Mean and SD. A one-way analysis of variance (ANOVA). Independent sample student t-test was used to compare continuous variables between the two groups. A two-sided p-value <0.05 was considered statistically significant. The obtained data sets were statistically evaluated and focused on the spectral ranges that correspond to the structure and conformation of proteins and other biomolecules. Biochemical Analysis: Hyperlipidemia is a major risk factor in the pathogenesis of atherosclerosis, a physiologic disorder that affects the coronary, cerebral and peripheral arterial circulation. Also, there is a close correlation between these diseases and lipid abnormalities, especially high level of plasma cholesterol. The experimental blood samples analyzed for biochemical parameters. The hypercholesterolemia markers assayed include cholesterol, triglycerides, HDL cholesterol followed by T3, T4, TSH, etc., and the other biochemical parameters analyzed for clinical correlations include creatinine, urea, uric acid, calcium, phosphorous, total protein, albumin etc. Table 1. 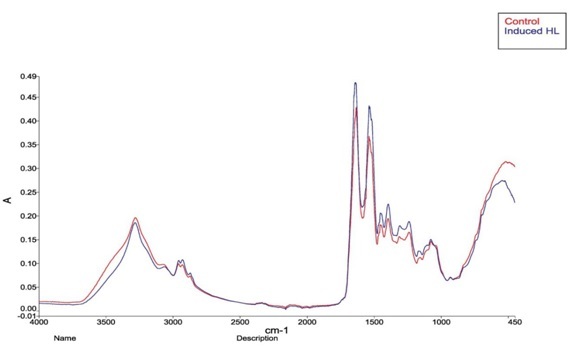 FTIR-ATR Band Assignment for the Control and Hyperlipidemia caused by Cholesterol-Rich Diet: The FTIR-ATR spectral peaks pattern for blood serum of hyperlipidemia induced by cholesterol-rich diet given in Fig. 1. A vibration band assignment is done with the idea of the group frequencies of the various analytes present in the sample. 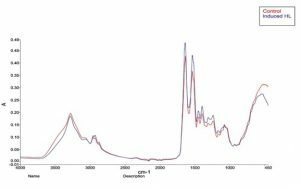 FTIR-ATR vibrational band assignment of bio-molecules of healthy control serum of Wistar rat Table 2. 9 1453 Asymmetric bending vibrations of lipids, proteins of CH3 groups. FTIR-ATR Spectral Studies on Different Organs of Wistar Rat Fed with High Cholesterol Diet to Induce Hyperlipidemia: A vibration band assignment is done with the idea of the group frequencies of the various analytes present in the sample. The overlaid FTIR-ATR spectral peaks pattern for different organs like kidney, liver, lung, muscle, and heart of hyperlipidemia Wistar induced by cholesterol-rich diet are presented in Fig. 2a-e.
Internal Standard Parameter Ratio for Blood Serum and Different Organs: The Internal ratio Parameter calculation and analysis requires spectra with a change in sensitive peaks and no change in sensitive peaks for control and experimental. Internal ratio parameter is calculated to fortify the results obtained from the FTIR intensity of absorptions. Internal ratio Parameter ignores the difference in the amount of sample analyzed; it nullifies the contradiction in the quantity of the sample. The changes in the FTIR-ATR band internal peak ratio calculation for various molecules in the serum of control and induced HL experimental rats represented in Table 3. The peak ratio is calculated for blood serum (Protein) sym & asym vib-(Lipids -FA-TGL) and HDL cholesterol ester (I2961/I1742), Amide I and Ribose–phospholipid (I1634/I934), Amide II and (Chol. estr)asym-PO4 (I1538/I1165) and (Lipoprotein) asym.vib. and (Cystic acid)s-s -str. (I1453/I532). The p-values calculated were 0.0016, 0.0001, 0.0001 and 0.0006 respectively are highly significant among control and high cholesterol-fed Wistar rat. As a result, it is suggested that all these absorbances ratios considered as a biomarker in evaluating the HL status. The changes in the FTIR-ATR band internal peak ratio of various molecules in the lyophilized organs of control and hyperlipidemic Wistar rats showed Table 4. The internal peak ratio for different organs the wavelength I2931/I1538 ((Lipoprotein)asym. str. and Amide II), I2879/I532 (lipoprotein)sym.vib and (cystic acid) s-s–str. ), I1742/I1634 (HDL cholesterol ester and Amide I) & I1453/I1040 (lipoprotein)asym. vib. and mucopoly-glu-str.) shows that there is a considerable rise in absorbance in an animal fed with high cholesterol diet than control Wistar rats concludes the positive effect of cholesterol-rich diet on different organs. The absorbance ratio for internal peak ratio for all four different intensities parameters shows that the liver, lung, kidney, and muscle are highly significant with a p-value of <0.01. Histological Studies: The high cholesterol diet fed to Wistar rat liver showed the appearance of microvesicular steatosis (fatty change- Fig. 3b) was manifested by the accumulation of lipid in the form of large cytoplasmic vacuoles within some hepatocytes displacing the nucleus to one side. Hepatocytes showed hydropic degeneration, swollen, vacuolated cells, and fatty liver Fig. 3a. During this study, other organs like muscle heart and kidney were normal in Wistar rat fed with high cholesterol diet to induce hyperlipidemia Fig. 3c. DISCUSSION: The association between hyperlipidemia and atherosclerosis has been demonstrated in many studies and trials 9, 10. In this study, hyperlipidemia was induced in rats by feeding cholesterol suspension with oil orally for 30 days and achieved hyperlipidemia, but other author achieved hypercholesterolemia with above 200 mg/dl cholesterol oral feeding for 10 days 11. Feeding cholesterol-rich diet on rats with body weight of 180 ± 10.0 g led to a rapid progression of hyperlipidemia resulting might cause atherosclerosis. Biochemical Evaluation of Blood Serum in Wistar Rat Fed with High Cholesterol to Establish Hyperlipidemia (HL): The cholesterol-rich diet fed to experimental rat for four weeks shows there was an increase in blood cholesterol level (269 ± 8.72) and decrease in the serum HDL level (39 ± 3.09) in the cholesterol-rich fed hyperlipidemia compare to control group (167 ± 31.10 - cholesterol and 47 ± 9.80 - HDL). Besides, the triglyceride and LDL level in Wistar rat fed cholesterol-rich diet was found to be higher (194 ± 5.03 and 165 ± 5.10) than the control healthy rats (120 ± 30.89 and 96 ± 5.11) and values obtained were statistically highly significant (P<0.001). These results obtained were agreed with earlier study and they reported that rats fed with standard cholesterol diet (coconut oil/cholesterol diet) to develop hypercholesterolemia with an increase in TG, and HDL cholesterol 12. Diet rich in cholesterol and saturated fatty acids increases the availability of acetyl CoA, precursor for cholesterol biosynthesis. This, in turn, increases the activity of HMG-CoA reductase, the rate-determining enzyme in cholesterol biosynthesis thus increases the synthesis of cholesterol in the body. Further, the amount of cholesterol returning to the liver is increased and thus plasma HDL-cholesterol raises 11. This increases the transfer of cholesteryl esters from HDL-cholesterol to triglyceride-rich particles in exchange for triglycerides. This leads to the increased serum concentration of triglyceride and a decrease in serum concentration of HDL- cholesterol 13. A moderate significant elevation in T3, T4, and TSH was observed (P<0.01) in this study do not clarify the exact cellular mechanisms by which cholesterol-diet leads to an elevated thyroid hormones 14. Similarly, various other chemical parameters in blood found to be statistically not significant. Table 1 and these involved the evaluation of the organ functions. The overlaid spectral pattern showed significant differences among control and cholesterol-rich fed Wistar rat. The present study spectral regions identified as 1165 cm-1 for ring vibrational mode of C-O-H and C-O-C bonds cholesterol ester with phosphoric acid and these results were not agreeable with, and they observed at 1700-1800 cm-1, 2800-3000 cm-1 for total cholesterol 15. Besides, this study also shows that the spectral region 1742 cm-1 responsible for C=O group of cholesterol ester (HDL) and 2961 cm-1 for triglyceride. But these results agree with the results of an earlier study where they observed spectral region between 900-1500 cm-1 for HDL and 2800- 3200 cm-1 for triglyceride 15. The absorbances of internal peak ratio for amide II / Cholest.ester)asym-PO4 / (Protein) sym&asym vib-(Lipids –FA-TGL)/ HDL choletsreolester, Amide I / Ribose –phospholipid and (Lipoprotein)asym.vib. / (Cystic acid) s-s -str. Table 3 was highest in the hyperlipidemic rat (3.4134, 5.3366, 6.7853 and 0.7510). The trends observed on absorptions of internal peak ratio of the experimental animal was more than control which supports earlier studies 16, 17 and suggested as an atherogenic index for evaluating pathological conditions. Table 4 shows the changes in the FTIR-ATR band internal peak ratio of various molecules in the lyophilized organs of hyperlipidemic rats. Internal peak ratio for asymmetric vibrations stretch of (Lipoprotein)asym. str. and amide II (I2931/I1538), (Lipoprotein)sym.vib. and (Cystic acid)s-s -str. (I2879/I532), and HDL cholesterol ester and amide I (I1742/1634) as well as (Lipoprotein)asym.vib. and Mucopoly-Glu-str. (I1453/I1040) of different organs shows that increased absorbance are observed for kidney, liver, lung, and muscle only, and similar observations are reported in earlier study 16, 18. But in case of the heart, no FTIR-ATR change is recorded in experimental animals which support the statistical analysis and value obtained are not significant with a p-value of <0.5. The intensities absorbance for of peak ratio (I2931/I1538, I2879/I532, I1742/I1634 and I1453/I1040) are highly significant and values obtained for liver, lung, kidney and muscle were highly significant (p<0.0001) compared with control and HL rats. The FTIR-ATR spectral analysis and histopathological studies on these organs indicate high cholesterol diet affect liver and kidney with the evidence of chemical variations observed. The results concludes that the damages in liver and kidney might be due to the involvement of these organs in vital metabolic roles during induction studies. In case of heart tissue of experimental Wistar rat fed with high cholesterol diet does not show any changes of absorbance compare with control and statistically, the p-value observed are not significant among control and hyperlipidemic rat. Though the blood serum shows increased cholesterol, the heart is not significantly affected which support the FTIR and histopathological studies and the reason might be the number of days exposure to cholesterol diet by the experimental animals is insufficient to alter the composition at the cellular level. Further increasing trends in FTIR-ATR spectral absorbance ratio obtained are support earlier study 19. Further, organs like muscle and kidney, the internal peak calculation ratio shows alteration in the composition in these tissue level and at the same time, histopathological studies shows unaffected. This might be probably due to reason that FTIR-ATR spectral studies could detect the changes of biomolecules in these organs early stage than by histopathological study. Internal peak ratio for asymmetric vibrations stretch of (lipoprotein)asymstr./amide II (I2931/I1538), (lipoprotein)sym.vib./(cystic acid)s-s –str. (I2879/I 532), and / HDL-cholesterol ester and amide I (I1742/1634) as well as (lipoprotein)asym.vib. and mucopoly-glu-str. (I1453/I1040) of different organs shows that increased absorbances were observed for kidney, liver, lung, and muscle only. The high cholesterol diet fed to Wistar rat liver showed the appearance of fatty change. The FTIR-ATR spectral analysis of Wistar rat fed with high cholesterol diet shows the changes in the chemical composition in liver and kidney only which support the histopathological studies. The ﬁndings of this study indicate that exposure to inducing agents are capable of inducing adverse signiﬁcant blood and chemical changes in the disease induced Wistar rats. ACKNOWLEDGEMENT: The Authors would like to thank the Saveetha University for providing Animal House Facility to conduct experiments and the Dean, Sophisticated Analytical Instrumentation facility (SAIF- SPU), St. Peter’s University, Avadi, and Chennai - 600054, using PerkinElmer Spectrum-Two FTIR Spectrophotometer with Attenuated Total Reflectance accessory. CONFLICT OF INTEREST: The authors confirm that there are no known conflicts of interest associated with this publication and there has been no significant financial support for this work that could have influenced its outcome. Mitchell BD, Kammerer CM, Blangero J, Mahanev MC, Rainwater DL, Dyke B, Hixson JE, Henkel RD, Sharp RM, Comuzzie AG, VandeBerg JL, Stern MP and MacCluer JW: Genetic and environmental contributions to cardiovascular risk factors in Mexican Americans. The San Antonio Family Heart Study. Circulation 2006; 94: 2159-2170. Syed M, Mark C and John FD: Management of dyslipidemia in adults. The Am Fam Physiol 2000; 1: 1-12. Katon JE and Micron: Infrared Microspectroscopy. A Review of Fundamentals and Applications 1996; 27(5): 303-314. Baulsir CF and Simler RJ: Advanced Drug Delivery. Reviews 1996; 21: 191-203. Zaidi TM, Khan AA, Hasan BM and Faruqi AN: Carbimazole induced thyroid histopathy in albino male Wistar rats during development. J Anat Soc 2004; 53(2): 4-9. Krasilnikova OA, Kavok NS and Babenko NA: Drug-induced and postnatal hypothyroidism impair the accumulation of di acylglycerol in liver and liver cell plasma membranes. BMC Physiol 2002; 16: 2-12. Palmero S, de Marchis M, Gallo G and Fugassa E: Thyroid hormone affects the development of Sertolic cell function in the rat. J Endocrinol 1989; 123(1): 105-111. Luna LG: Mannul of histologic staining methods of the Armed forces institute of pathology 3 ed. 1968. New York Mac. Graw Hil. Lichtman AH, Clinton SK, Iiyama K, Connelly PW, Libby P and Cybulsky MI: Hyperlipidemia and atherosclerotic lesion development in LDL receptor-deficient mice fed defined semipurified diets with and without cholate. Arterio scler. Thromb. Vasc. Biol 1999; 19: 1938-1944. Ganguly P and Alam SF: Role of homocysteine in the development of cardiovascular disease. J Nut 2015; 14: 6. Reeves PG, Nielsen FR and Fahey GC: AIN-93 purified diets for laboratory rodents: final report of the American Institute of Nutrition Ad Hoc writing committee on the reformulation of the AIN-76 rodent diet. J Nut 1993; 12: 23- 56. Dietschy JM, Turley SD and Spady DK: Role of liver in the maintenance of cholesterol and low-density lipoprotein homeostasis in deferent animal species, including humans. J Lipid Res 1993; 34: 1637-1659. Augustin KT, Aswathy N, Lekhespillai and Razia S: Beneficial effects of garlic (Allium sativum LMN) on rats fed with diets containing cholesterol and either of the oil seeds, coconuts (or) groundnuts. Indian J Exp Biol 2001; 39: 660-664. Rang HP, Dale MM, Ritter JM and Flower RJ: Rang and Dale’s. Pharmacology. 6th Churchill living stone Elsevier 2007; 321. Khatheeja S, Safiullah A, Mohan SK, Priya V and Prabhakaran AR: FTIR-ATR spectroscopy as a diagnostic tool in the diagnosis of hypercholesterolemia induced by cholesterol-rich diet in rats. Inter J Pharm Sci and Res 2018. Khatheeja S, Safiullah A, Mohan SK, Priya V and Prabhakaran AR: FTIR-ATR biochemical and histopathological studies on phenyl hydrazine induced hyperbilirubinemia in rats: A comparative study of diagnostic approaches. Inter J Pharm Sci and Res 2018. Kamatchi S, Gunasekaran S, Sailatha E, Pavithra R and Kuppuraj P: FTIR-ATR spectroscopic technique on human single intact hair fibre. A case study of thyroid patients. International Journal of Advanced Scientific Technologies in Engineering and Management Sciences 2016; 2(5): 1-6. Gunasekaran S, Uthra D, Sailatha E and Anita B: FTIR spectral study on jaundice blood samples before and after treatment. Asian Journal of Chemistry 2010; 22: 51-56. Khatheeja S, Prabhakaran AR, Mohan SK, Selvanathan P and Safiullah A: Biochemical variations and FTIR-ATR spectral studies on renal disease induced by gentamicin in male Wistar rats. International Journal of Health Sciences & Research 2016; 6(12). Haas SL, Möller R, Fernandes A, Dzeyk-Boycheva K, Hohmann J, Hemberger S, Elmas, E, Brök- hmann M, Bugert P and Backhaus J: Spectroscopic diagnosis of myocardial infarction and heart failure by Fourier Transforms Infrared Spectroscopy in Serum Samples. Applied Spectroscopy 2010; 64: 262-267. Khatheeja S, Safiullah A, Alsawalha M, Prabhakaran AR, Veeraraghavan VP and Mohan SK: Comparative studies on biochemical, histopathological and ftir-atr spectral studies of hyperlipidemia induced by cholesterol rich diet in rats. Int J Pharm Sci & Res 2019; 10(2): 836-45. doi: 10.13040/IJPSR.0975-8232.10(2).836-45.